I was back at home after my MBA course was over. I had a break after which the placement-interviews were to commence. I had ordered five items- a dress, a bracelet, a pair of shoes and two suitcases from an online shopping-site. "I love the black and white zigzag pattern on the shoes! They remind me of Zebra", my sister remarked. "That's why I ordered them! I wish to use all this and pose for a picture and submit it for a chance to win the Travel-Junkie-contest." 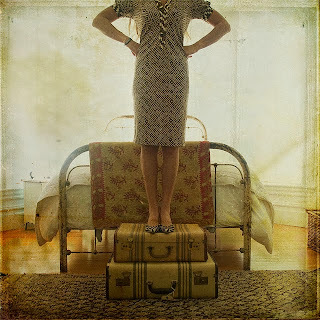 I tried out my new dress, bracelet and shoes and posed atop the two suitcases. I wanted to show my zeal and zest to travel! "Don't click my face, ok?" I instructed my little sister as she went on to capture my pose. My sister was alarmed! "You want me to cut off your pretty face from the picture!" "I would have/could have/should have looked pretty...but for my zit and pimples that spoil my beauty..." I sighed. "Picture-perfect!" I said when I saw the photo my sister had clicked. "Would have been picture-perfect with your face...", my sister remarked. I was sick and tired. "Would my face come in the way of my job-interviews?" I shuddered. That's when we went to granny's place for some days. Granny had the most awesome garden with many trees. I had spent many summer-vacations there. "Oh dear! How thin you have become! Don't they give you food to eat at the hostel?" Grandpa was concerned. "And what have you done to your face?" Granny eyed my pimples disbelievingly. "Now that you are here, you'll be fine in a few days!" they chorused. Granny didn't lose a day. She made me drink the juice of bitter-gourd and made me eat chutney prepared by mashing leaves of Neem tree! 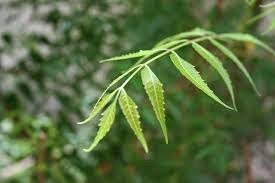 And yes, my face looked green too as she tried her natural therapy- mask made of Neem leaves and other ingredients! Needless to say, that didn't make anyone go green with envy! My youngest aunt, who visited my Granny's saw me looking green and feeling blue! When the next day, I found that my skin had reacted with a severe outbreak of irritation, my aunt advised that I can try a new cure! I still continued with Granny's cure as it was "natural". I used it religiously and within a few days, I earned back my pimple-free & zit-free face! I thanked it a zillion times! I happily posed for a lot of pictures with my family. We returned home. It was time for me to leave home and get back to my institute to attend the job-interviews. Now that I had a clear face, I was assured and more self-confident. I was filled with renewed zeal and zest! Then, I got the great news that my (headless) photo-submission had won the Travel-Junkie contest! The organizers had requested my latest pic to display the photo of the winner on their website! This time I was formally dressed in a Saree. I intended to get a pic clicked that I could use for my job-interview too. My sister clicked my photo. Sharp, lighthearted writing; well done. Wonderful story! Where are you getting the ideas of clubbing different concepts (to which you have linked it) from?!?! I am always curious about this! Prompts are like challenging jigsaw-pieces that seem to form a picture in my head & I have to share the outcome! Anita, great story! I love the photo on the suitcases. Thanks Linda :) I love the photo too! It's courtesy the photo-prompt at Magpie Tales. You seem to be in winning mode with a pimple free face,the contest won and the certain positive outcome in the interview. You are so right! So many winnings in this story :) We all love winner-stories! And it was an interesting read! Delighted that you found it interesting! Very fun story it's a Win! Win! Great that you enjoyed reading this, Karen! The battle of pimples won, wish you another blog win, Anita! great story for the letter Z! Tried a lot, but yet to win a travel Blogging contest! Thank you so much for the inspiration, Bikram! I believe- Keep trying & win! Well written. All the best for the contest Anita. I like that you kept calm and never lost your head , even when grannies therapy wasnt working , which it was probably never meant to ! In reality, all my Granny's therapies were very effective. This is just a fictitious story! Very well done for the different prompts. Wish you the best for the contest! Thanks for stopping by, Nikhi. Anita i think u r a great story teller and can build stories around anything even if it was something that scares the hell out of many young boys and girls. Pimples. Although hahahaha nowadays i see guys getting more paranoid about pimples than girls. This whole bunch of street theatre guys who gave a high voltage power packed performance the other day refused hot samosas can u believed it !!! denied hot samosas on a chilly winter day because one of them said, " It gives them pimples...". And they asked for Biscuits !!! can u imagine not pizza not pasta or burger but plain and simple biscuits instead because even all those gave them pimples. Delighted that you liked my story! Prompts combined with real experience!